Writing this was hard. I didn't hate Batman V Superman: Dawn of Justice, I liked it. I knew, objectively, that it wasn't as good as a movie—as successful at what it set out to do—as Captain America: Civil War when I saw the "twin movie" later in the summer. Marvel's offering was just as long but way breezier, was just as epic in a more established and grandiose universe, was just as (at times implausibly) intricate but more grounded in character. But I've been thinking about Batman V Superman, with it shades of grey, it's aspirations to high-minded visual allegory, and it's effort to evoke the real-world implications of its narrative long after Civil War faded into memory as an enjoyable spectacle full of sound and fury, signifying nothing. I can't really take the latter's moral debate seriously when the oversight of General Ross in conveying the "new rules" wants to blame Steve Rogers for the wreck of their own recent murder-heli-carrier fleet... or the collateral damage in fighting off an alien invasion to which they themselves had responded with a nuke aimed straight at Manhattan. The anti-superhero sentiment settles any ambiguity later in Civil War by disappearing heroes into a submerged Stygian super-prison. The right-and-wrong in the tale is about as black-and-white as it gets. It's not easy to blame strategic studio decisions for less-than-optimum outcomes of movies upon which a lot of fans' hopes and even identities seemingly depend. It appears to be a lot easier (based on the internet's response) to blame the director, the top-named individual at the head of the credits, regardless of whether or not the key decisions that formed the outcome originated with them. Zack Snyder has always had a controversial relationship with comic book fans, crafting distinctive and bold films from comic source material in both 300 and Watchmen,that despite solid earnings nonetheless drew criticism from some circles. 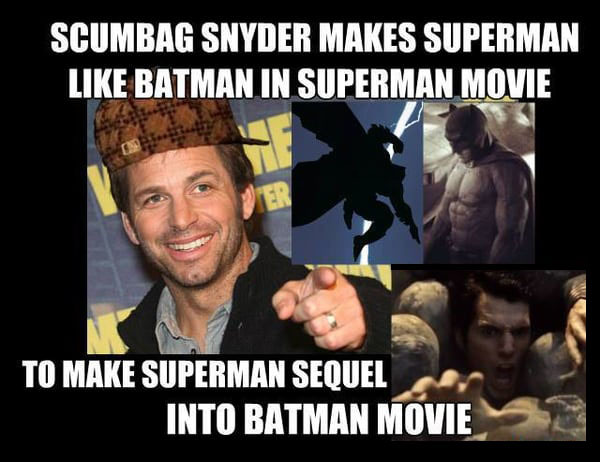 For some fans, this previous reaction to his works became a self-fulfilling philosophy of disappointment, and certain circles of the internet erupted in denigration well before the movie's release as lamented in an early March 2016 post on moviepilot.com by Steven Belknap called Why the Hate: Zack Snyder. Hating on the director seems to have become a pastime for fans especially susceptible to the polarizing effects of this new, digital ability to band together in binary, extreme reaction. Forgoing scriptwriters, producers, studio executives, stockholders... irate fans on the internet had found their favorite scapegoat. Batman V Superman: Dawn of Justice drew significant box office revenues, earning $40 million more in U.S. box office than Man of Steel, and just $30 million less than Marvel's Guardians of the Galaxy... but just over half of what was pulled in by The Avengers. Pundits with the movie's performance in their crosshairs have quoted the marketing spend on the film a bit disingenuously... ignoring the fact that part of the spend is an investment in a series of future movies as well. Yet arguably WB can't escape the fact that the film made almost $80 million less than its "twin film," Captain America: Civil War, on less marketing. In the epic battle of this long-term studio war (that will no doubt itself be adapted to its own epic insider film one day), Marvel/Disney had won. Later that same year, Suicide Squad would release to a reception similarly marked by critical derision and heated debate. Still later, Disney would release Doctor Strange to critical reception that was positive but muted, revealing the Marvel film that might best have been challenged by a WB/DC release that year. 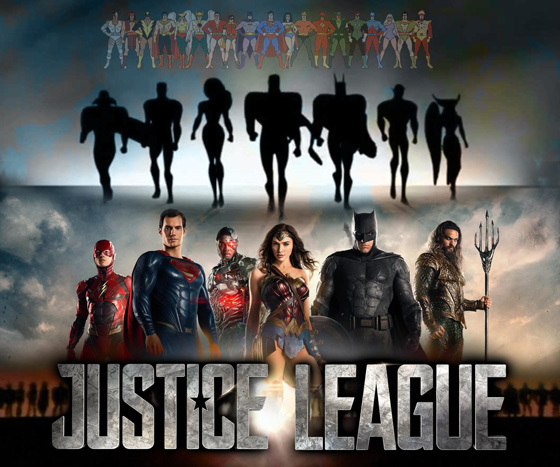 As it is, critical reception of a movie and its story beats cannot erase the story beats themselves, and if it was more crucial to Warner Bros. that Batman V Superman: Dawn of Justice establish the "Meta-Human Thesis" and introduce the various Justice League hero concepts (if not characters), then the movie certainly did... include those story beats. To many DC fans, seeing these arcs brought to life for the first time ever is enough. These are certainly the viewpoints for which the critics have the least amount of sympathy or understanding, and rightfully so, according to their purpose. Look, I really enjoyed “B v S,” but two things stuck out to me. One, I knew it wasn’t made for a “general audience.” The minute the last credit rolled, I said to myself: “Ugh. Oh, lots of folks aren’t going to get this.” But I really think you’re onto something with this “new frontier” of movie creativity. This hasn’t been done before. The second thing that stuck out to me was that this movie is overwhelmed by the feeling that they are looking so far ahead. They had so much to set up, and it makes the movie suffer a little bit. I still enjoyed it, but it almost feels like “B v S” was a visually stunning sacrificial lamb [emphasis added] to get us as quickly as possible to the rest of the DCU on film. Did it feel a little rushed with all that they tried to stuff in here? Yes. But I really think the prize WB and DC have their eyes on is multi-connected cinematic success. And if “B v S” is the polarizing bridge to a healthy helping of many successful superhero franchises, then so be it. Warner Bros. have continued to place their faith in the directing talent of Zack Snyder for the upcoming Justice League adaptation, and this more than anything speak to his and the studio's alignment in their goals. If anything, I would speculate Mr. Snyder has done nothing but win more favor at Warner Bros. management, hampering his stated career goal of adapting The Dark Knight Returns and letting his film "take one for the team" of the accelerated Justice League. 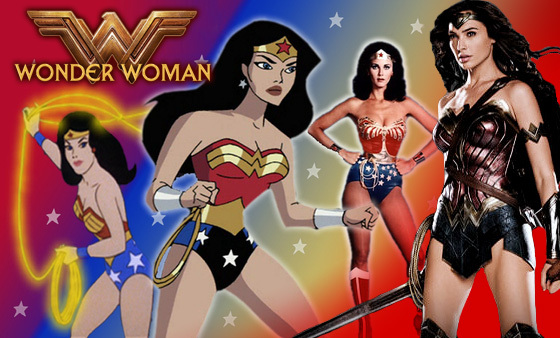 As the DC Extended Universe marches forward, shortly after publication of this article, we will finally have the release of the first individual hero movie since 2013's Man of Steel, and I among many others are eager to see how they will handle a proper movie adaptation ofWonder Woman. It's about time she had a proper movie adaptation. She'll be the first major female hero to get one. The critics were right that Wonder Woman became the bright spot of Batman V Superman, but I hope I have also shown that her introduction helped compress and muddle a movie that might have been better with her introduction postponed until the next one, shortly thereafter. Would my proposed Batman Vs Superman: Knightmare movie have been a dour, grim spectacle without her presence, yet faithful in spirit to the Miller original (in the one opportunity it seems we'll get)? Would that one-more-Superman movie I propose, Superman Doomsday: Dawn of Justice, have proved a better way to introduce the Justice League members in giving Superman along with Batman his traditional comic role in helping to organize the League, and the grueling gauntlet that won everyone to his side before his comic book death? It's hard to have a Justice League without Superman. That's how I feel about it. It was always a super-intriguing concept to me to have this opportunity to have him make that sacrifice but also have him be this, in a weird sort of way, the why of Justice League: What do you do now with him? What does the team think? What does the world need? All that comes into play. It's fun for us but it'll be interesting for audiences what we do with him. I hope my perception of the Wonder Woman's introduction will be deepened and evolved by the story it presents, even ruling out my suggested revisions with a storyline that crowds it out for something better. Later this year I will happily turn out for Justice League, and I will hope again to have my alternate hopes for how the foundations could have been laid rendered obsolete and replaced with something more clever, more real. Seeing the upcoming DC team-up realized will be enough for some fans. For critics and other fans, the scrutiny on the upcoming film will be HUGE. That's my favorite thing to have a movie do to me: take how I imagined it all turning outrealized, and do it at least one better. I liked Batman V Superman: Dawn of Justice, even as I have to admit the final result was not a great movie. It was like the radio edit of a great movie, a DJ-mashed mix-tape of Batman and Superman's greatest hits, featuring Doomsday and the Trinity. While General Audiences continue to rack up views on the "singles" of the action scenes on YouTube, and dilettantes extoll the virtues of the Ultimate Edition of the album, I hope to someday get confirmation of my true-fan purist suspicion that there is a "lost album" somewhere in there that was killed before it was born. I hope the upcoming Wonder Woman and Justice League will both be free of the burden of multiple purposes, and provide me with the more satisfying (and less binary) experience of both enjoying the movie, and having the "conversation at large" recognize it merits. As long as they don't spoil it in the trailer!!! As I was finishing this article, the news broke that Zack Snyder would be stepping away from the final stages of post-production of Justice League to deal with a horrible family tragedy: the loss of his daughter. The Avengers director Joss Whedon will be stepping in to film final additional scenes and help complete the film. Long kept private, the Snyder family decided to release this painful information publicly to prevent the negative PR of his departure from affecting the film.. I hope this will erase a bit of the binary divide and acrimony towards the man and I hope the effect will endure, and remind us all to measure our expressions of criticism against the yardstick of decency. As fans of these modern myths and their oft-tellings, we may have disagreements on how the stories should be told. In the future, I hope it won't take such a tragedy to remind us that the storyteller deserves not only respect for the bravery to take the stage, but the same basic human respect you would give your neighbor. I can't imagine this loss. My heart goes out to the Snyders and all affected.